Born in Swiss town Wohlen, Sforza started his career in his hometown club FC Wohlen. He was signed by FC Aarau in 1989, where he impressed commentators and fans alike. Sforza was signed by Swiss giants Grasshoppers Zurich one year later and he represented Grasshoppers during three successful seasons. 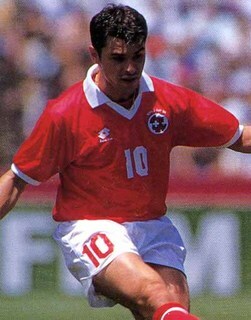 He won the 1991 Swiss Super League championship with the club, and made his national team debut in August 1991. In 1993, he moved abroad to Germany to play for 1. FC Kaiserslautern. Sforza became the general of the Kaiserslautern midfield and was recognised as one of the best midfielders in the German Bundesliga championship. After two seasons at Kaiserslautern, he was bought by German giants FC Bayern Munich in 1995. Sforza was signed at the same time as German superstar Jürgen Klinsmann, compared to the homely smalltown club Kaiserslautern, FC Bayern was a team with many stars. Conflicts between Klinsmann and team captain Lothar Matthäus poisoned the atmosphere and many scandals underlined why FC Bayern is nicknamed FC Hollywood. Bayern also missed out on the German championship for the second season in a row, though Sforza was a part of the 1996 UEFA Cup winning FC Bayern team. Sforza had trouble settling in at FC Bayern, and after one season at the club he moved to Italy. He signed for Internazionale, where he was united with former Swiss national team manager Roy Hodgson. Sforza also had problems performing at Internazionale, and he spent a lot of time on the bench. After a single season he moved again – but this time to known territory. In time for the 1997–98 season, Sforza moved back to Kaiserslautern where he immediately made an impression. Even though Kaiserslautern had just been promoted from the German second division, Kaiserslautern became German champions, beating FC Bayern to the title. Sforza spent two more seasons at Kaiserslautern, impressing commentators and fans alike. In 2000, he decided to give FC Bayern Munich another try. Once again, he failed to perform and spent a lot of time on the sidelines. FC Bayern had many star players competing for places, and the team won both the 2001 Bundesliga and UEFA Champions League titles. After two seasons at FC Bayern, he returned to Kaiserslautern in 2002, joining Kaiserslautern for a third time, Sforza's "double return" is unique in the German Bundesliga. The aging and now somewhat injury-prone Sforza helped FCK avoid relegation, however, in October 2005, he had a public falling-out with the club and was blackballed. He retired at the end of the season, in summer 2006.